How many times have you had a full bottle of your favorite beverage only to have it slip from your hands because of condensation? That never has to happen again thanks to The Bottle Grip. Simply slip the bottle into the grip, and you have all the security and ease of a mug. You don't have to worry about drippy bottle sweat anymore. The Bottle Grip fits most standard bottles regardless of the liquid inside. 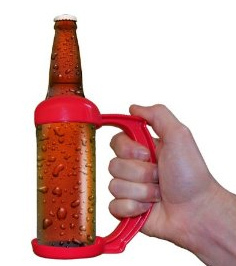 Use it for your favorite beer or soda, and never lose your grip again. Comes in a package of two bottle grips.